While I will address each particular tip-off according to the relevant deal, there are four general rules that should be applied to all false dealing and should lessen your chances of being caught. These are abstract principles and as any serious card worker will discover, mastery of card technique ultimately has nothing to do with individual techniques themselves and everything to do with principles. The first such principle is angles. I mentioned earlier that if someone can see the top card of the deck it is very difficult to deal invisibly. There are two potential solutions to this, the first, and generally the easiest depending on the environment, is to make use of angles in such a manner that the top card is not visible to the audience. Depending on the false deal and circumstances, this generally occurs by a simple tilt in the wrist. This idea of angles goes well beyond simply hiding the top card though, you can use it to cover knuckle flash, finger flair, a get ready etc. Second, we have the all important question of speed and smoothness. For a lot of deals speed is extremely helpful, in fact I would recommend dealing fast essentially all the time. Ideally, your deal will begin so quickly that someone watching can't even see the top card coming off the top of the deck. In addition to this, it is important to be very smooth. There is some concern about dealing too quickly, as it may not seem natural. To avoid this, or rather, to create the illusion that you are in fact dealing slower than you are, you can accelerate certain portions more than others. 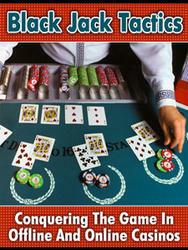 In other words, you pull the card off of the deck extremely quickly and then slow down slightly as the deal continues. Furthermore, by leaving a sufficient period between one deal and the next you further enhance the illusion that the deal is natural rather than rushed. Again, adding smoothness to this process helps; you don't want the deal to possess a staccato flow. Finally, you can help to create artificial speed, through relative motion by moving both hands at once. 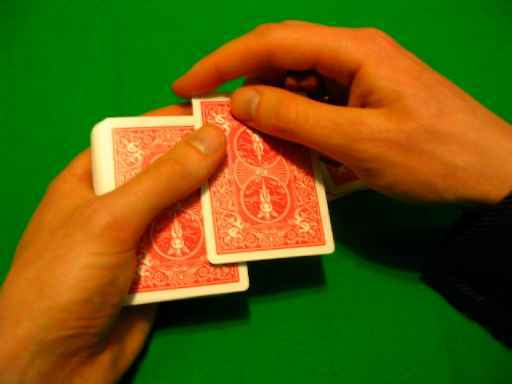 If the hand performing the take is moving in one direction and the hand holding the deck is moving in another then each hand must move only half as fast to offer the same effect of speed and thus add to the deception of a slower deal. Third, we have the surprisingly deceptive notion of covering a small motion with a larger one. For example, if you are going to move your thumb slightly, either in a push-off or pullback motion, you should move your entire hand at the same time, and typically in the same direction. Performing both motions at once helps to decrease the attention given to the smaller action and make it seem less significant. In each case where small actions are required and larger actions are possible, they should be used as cover, allowing the action to be performed openly yet deceptively. Fourth and finally, there is the idea of using one motion or action to cover another. By this, I am referring to something like using natural hand cover offered by performing the take, to cover a pullback action and obstructing the view of the audience. Another good example would be the concern of sound. At times it will become virtually impossible to eliminate a difference in sound, but you will find that it is possible to create other sound to cover this disparity. This could be as simply as talking while you are dealing, both as a means of distraction and also as a means of creating obscuring noise to lessen the chances of detection. I'm sure there are many ways you will find to make use of this and the other principles in order to help improve the artifice of false dealing.